About 100 people were told to leave their homes following a gas explosion at a property in north-east London. Emergency services were called to a commercial property below a block of flats in Farnham Road, Harold Hill, shortly before 13:30 GMT, police said. No injuries have been reported and residents were later advised it was safe to return to their properties. All road closures and cordons have been lifted, police said. 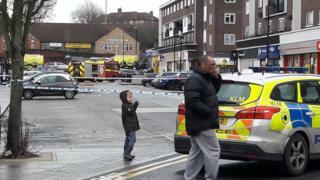 Police officers, the London Fire Brigade and the London Ambulance Service were all sent to the scene after initial reports of the blast.